Community-minded and strongly principled, the Gargoyle race is powerful in both magic and combat, and is renowned for their superior craftsmanship, particularly with unusual materials. 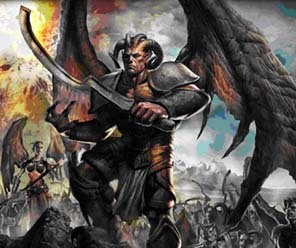 The Gargoyle Race is a race of playable creatures introduced with the Ultima Online: Stygian Abyss expansion. When Ultima Online was first released, Humans were the only playable race. With the release of Mondain's Legacy, Elves became the second race. Gargoyles are the newest playable race with the Stygian Abyss expansion. Gargoyle player-characters are not affected by Gargoyle Slayer weapons. The Gargoyles are often mistaken as demons but are in fact a proud mystical race with an ancient history. Gargoyles have no hair on their bodies. Their horns come in several varieties and sizes and are usually left unadorned. Gargoyles have been a part of Ultima lore since Ultima IV: Quest of the Avatar, one of the most popular titles from the single-player series of Ultima games. Gargoyles have been known for their deep-held beliefs, including a belief system apart from the Eight Virtues of Lord British. They are also known as skilled artisans with their own secrets of crafting powerful items. A Gargoyle's powerful wings carry them over land as fast as a galloping horse and grant them access to special Gargoyle-only areas. Flying makes it possible for Gargoyles to move at a speed equal to being mounted, or the equivalent being double the usual walking pace of Humans and Elves. In situations of great danger, a Gargoyle's natural ferocity will take over, granting speed and power at the cost of defenses. 15% Damage Bonus and +3% Spell Damage Increase for each 20% health lost from maximum health (60% weapon damage bonus cap and 12% spell damage bonus cap). A strong cultural emphasis on art and craftsmanship grants the Gargoyles an increased chance to imbue and unravel magical items. Gargoyles have an increased chance to imbue and unravel magical items. All Gargoyles are trained from childhood in the skill of Throwing, giving them a basic competence with missile weapons. Minimum Gargoyle skill in Throwing is 20.0. Gargoyles receive a 5% bonus to hit that stacks with HCI. No longer goes over 45 HCI cap. Gargoyles cannot learn nor use weapons that require Archery. Gargoyles have an intuitive understanding of Mysticism, allowing them to cast basic Mysticism spells without further training. Minimum Gargoyle skill in Mysticism is 30.0. Gargoyles receive +2 Mana Regeneration which stacks with Meditation and Focus. This page was last modified on 7 March 2019.